The underwater cameras serve two purposes. They allow us to view the turbine as it is operating underwater. The cameras also serve as inputs for a fish deterrent system. The cameras are constantly taking pictures of the turbine as it operates. Each image is being analyzed by a computer algorithm that has the ability to determine if there is a fish in the image. If the computer algorithm detects a fish a set of underwater ultraviolet lights flash to scare the fish away from the turbine to prevent the fish from being harmed by the turbine blades. This fish deterrent system is an experimental system created by Lite Enterprises, a New Hampshire based company with expertise in wildlife deterrent systems for wind turbines other infrastructure. 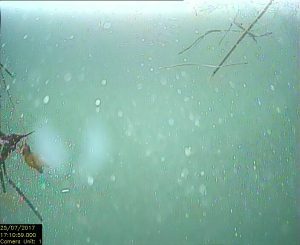 The image above was taken with the underwater camera in July before the turbine was installed on the turbine deployment platform.